Our Survival at Stake: Do We Have a Future? As much as we can do it, we should avoid living our lives on assumption that a belief is true simply because we’ve been told it’s so by family, government, religion, politics, economics, or the collective culture in which we’ve been raised. The only fixed verities are those within the scope of natural law with its defined predictability confirmed by replication. Our responsibility should be to explore those verities affecting our well-being and allow them fullest scope. We never escape the inexorable operation of those laws, for whatever we do, there is always a consequence. But sometimes we get to choose. There is no inherent purpose to life, though many moralists like Tolstoy have implied one in asking, How ought we to live? Nature works through selection only, reinforcing those causal elements promoting regeneration. Often it works with infinitesimal numbers, a million seeds to effect a single germination. It has no ethics. It is devoid of Mind. We pride ourselves on our freedom, but we are overwhelmingly conditioned by biology and complex behavioral repertoires sanctioned or extinguished by environment. It is not the future that shapes us, but what has happened to us that defines what we think and do. Conversely, this defines our tragedy that may doom us on this earth. We were not born into a preset regimen other than one genetically imposed, so Locke was right about the tabla rasa, or clean slate, notion of our infancy. Preconditioning is what happens as we make our journey. It follows that each of us needs to recover that initial state; that what I believe or do should be based on immediate consequences rather than because I am told to do so by law, government, religion or individuals. We do need laws in a world of many to ensure equal access to the trough in the context of safety, but there is nothing sacrosanct about any law, belief or opinion that allows it to go unexamined. One of the inherent drawbacks of the human condition is superimposing belief and practice on others. History, accordingly, is often bloodied with the cruelties of absolutism forced on others, often in the context of religion or secular ideology. This week, the Ukraine remembers its 3 million dead, starved to death in 1932-33 by a Stalinist regime bent on enforcing collectivization of that nation’s farmland. Other than climate change, humanity’s greatest threat comes from Islamic extremists bent on returning to the way of the sword, or Jihad, in imposing their beliefs. The danger lies in Islam’s not merely being a set of beliefs, but a whole way of life regulating every human behavior, codified ultimately in Sharia mandate. I alluded earlier to the behavioral quirk in us that may cause our doom. Conditioned as we are by immediate consequences, we often cede the future for the dividends of the present. Such is our present circumstance with meeting the exigencies of global warming, declining resources, and burgeoning population. In short, unless we can render the future more palpable, allowing us to help shape it for those who come after; indeed, assure its livability with reasonable happiness, then we may be moving into our final chapter. While altruism is a tenant within humanity and perhaps, in evolutionary vein, promoting survivability (see E. O. Wilson, Sociobiology, 1975), we too often exercise our limited freedom for the immediate. Like the heroic soldier forfeiting his life on the battlefield to save the lives of his fellows, we need to emulate a consciousness of others that may often conflict with our personal happiness and achievement. Evolution, paradoxically mindless, has always arbitrated for the future over the present as denominator of survivability and made you and me possible. The Renaissance philosopher I’ve admired all my life, Francis Bacon, summed it all up in saying, “Nature to be commanded must be obeyed.” Do not base your life on the beliefs of others. Live for the world of ideas and sort out those verified by the best science. Live in the fullest moment of today, but not without regard for the future of your fellows. 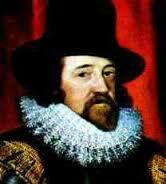 This entry was posted in Lifestyle, Psychology, Reflections and tagged altruism, evolution, natural selection, Sir Francis Bacon. Bookmark the permalink.